There is lots of good information available regarding tips for economizing your budget, but relatively less information about how saving fits into your overall strategy for your personal finance. Saving is in fact, rather passé today. Most Americans do not maintain a large cushion of savings. This is a shame, as saving can have a huge impact on your wealth. The first point is savings should be a core part of your strategy. Saving should be a core part of helping you achieve something greater such as building up a nest egg or obtaining capital to start a business. It’s not about gathering money for the sake of having money – that’s hoarding. Even a basic savings plan will help you better answer questions such as how much money you need and when you’ll need it. Saving will also help you to able cope with finance challenges like overspending or changing priorities that can derail your good intentions. Inflation is defined as a sustained increase in prices over time. This is important because high inflation can erode the amount of stuff or services your money will buy. Since you’re reading this blog, you probably already know what inflation means, so I won’t try to further define it here. The main idea is that anything you put away needs to beat inflation to keep your savings from falling behind. So how much do you need to get to beat inflation? Well, a good rule of thumb is 3% annually. Absent a goal, lots of people ask how much they should be saving. The truth is most people can manage ten percent of their income. Whenever we have this conversation with my friends, they inevitably start to say that they can’t save 10%. They complain that rent is too high, car payments are too much…etc etc. The way around this initial reservation is to start with a small amount, like 5%. Once you find that it doesn’t impact you that much, you can then gradually ramp up to 10% or 15%. Your expenses and lifestyle probably won’t be all that affected if you take a gradual approach. 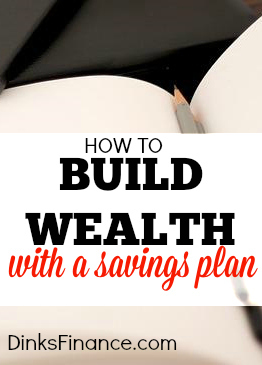 Finally, the main point to consider is that savings can fit into your overall personal finance strategy. For example, you might be interested in putting a house down-payment together, or you might want to build up a cash reserve in case you have major medical problems. A savings plan that beats inflation can be an integral part of this. For example, my wife and would like to have $4 million in net worth. As part of this we saved up $21,000 dollars so we could buy our first house in DC. We raised the money partly by flipping an investment property, partly by saving some of our salary income, partly by diverting some of our dividend payments and partly by finding and selling things on Craigslist. The whole process took about 10 months – not bad considering that my wife was our sole breadwinner. The house is currently a rental, which is generating $350 per month income after expenses. The house is located in a good area of DC and the value has recently increased by $15,000. So, the fact that we saved up the $21,000 has resulted in ongoing value as evidenced by the rental income and ability to capture increasing real estate prices. In short, for us having a saving plan had a huge impact on our wealth. I believe people save and not hoard money. You are right about that. Saving money to have money is kind of off. My reason is simple: so that when the time comes and unexpected expenses come, I would not have to rely on borrowed money. I’ve been there and it’s not a pleasant experience. Savings is certainly one of our main principles such as, saving up to buy larger more expensive items instead of using credit. We aim to save more than 10% every month. Not only do we have emergency savings but we have savings set aside for bills that we know are coming due. Also, savings of a different kind from coupons keep grocery bills down. Jen – very sensible. Don’t forget though, that inflation will eat away at your savings, so you’ve got to take at least a little bit of risk to preserve your purchasing power. CBB – do you think you could jack up your savings to 12% or 15%. Saving money is the largest single contributor to net worth. 10% is actually quite small, most people (especially with no dependents) could be saving much more. I sat down with a few friends in the last week that claimed they couldn’t save more than 5%. After writing down all of their expenses we managed to get them to a savings of 30% by eliminating a lot of un needed products and services (e.g cooking 5 times a week instead of 3, taking lunch from home, downgrading their internet and cell plans etc etc). Will – yes of course 10% is pretty small. I agree that a lot of people are in your friends position. The key part is getting from knowing that you can save 30% to actually saving 30%. Its the behavioral piece that’s lacking in a lot of people.